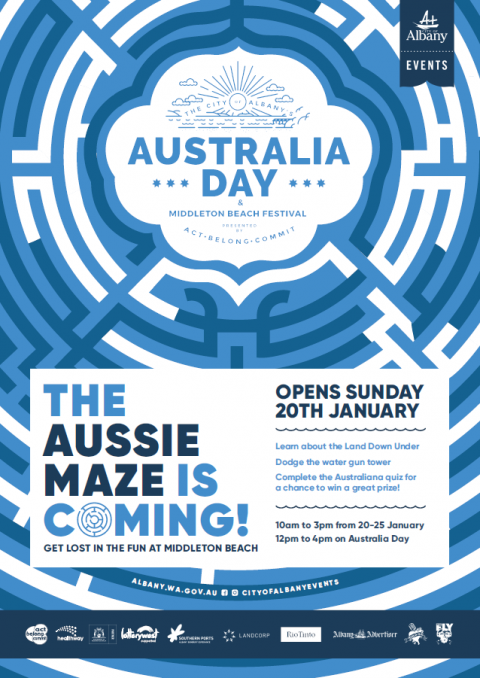 Families will get lost in the fun at Middleton Beach when a big Aussie-themed maze comes to Albany for the first time as part of the week-long activities at the Middleton Beach & Australia Day Festival from January 20 to 26. 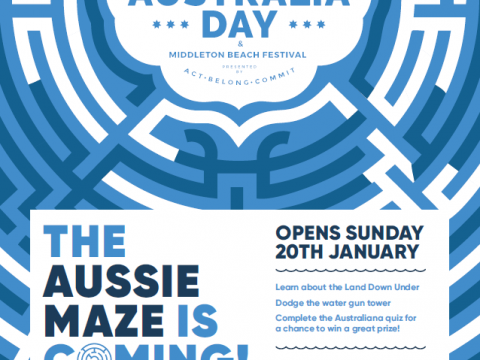 Opening on Sunday, January 20, this exciting new attraction is all about the ‘Land Down Under’, with a water gun tower, an Australiana quiz to test your ‘Aussie-ness’, and an Aussie Animal Hunt for younger children. City of Albany Executive Director Community Services Susan Kay said the variety of activities at this year’s festival was ‘a-maze-ing’. 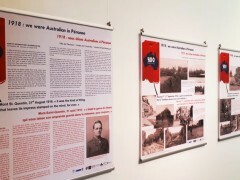 “The Aussie maze will certainly be a lot of fun for families and we’re very excited to be able to bring it to Albany this summer thanks to the wonderful support of our event partners,” Mrs Kay said. From January 21, Middleton Beach will become a one-stop-shop for summer fun with laserscape, bouncy castles, stand-up paddle boarding, yoga classes, sand sculptures, daily workshops and more. Another new festival feature will be twilight artisans markets on Friday, January 25 consisting of over 20 stalls for visitors to browse and buy from 4pm to 8pm. 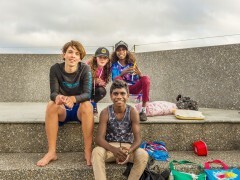 The week will end with the annual Australia Day activities, which includes the Rotary Club Breakfast from 7am at Eyres Park, followed by the Men’s Resource Centre HBF Fun Run at 8am at the beachfront. From midday, the Australia Day Festival will come alive with all the workshops and activities from throughout the week as well as bubble soccer, giant games, zumba, beach volleyball, Jamie the Clown and more. 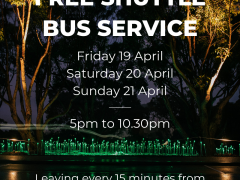 The day ends with an outdoor movie screening of Moana at sunset with food and drink available from surrounding businesses. 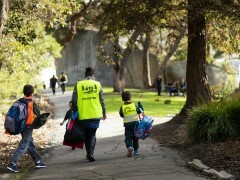 The Middleton Beach and Australia Day Festival is presented by Act-Belong-Commit and proudly supported by Healthway, Southern Ports, Lotterywest, Landcorp, Rio Tinto, Albany Advertiser, Gold MX and Fly FM. 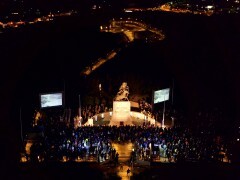 Visit www.albany.wa.gov.au or the City of Albany News & Events Facebook page for a full program.